I bought a Record 148 dowelling jig back in about 1971. 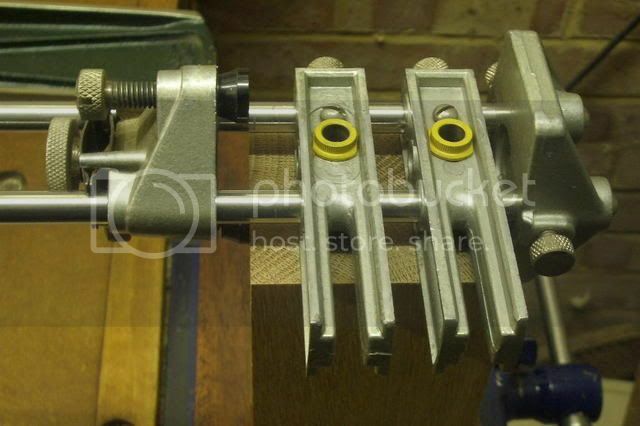 Like most people who own one, I reckon it's the best dowelling jig ever made. I don't use it much since getting a biscuit jointer but still find it very useful for various jobs. 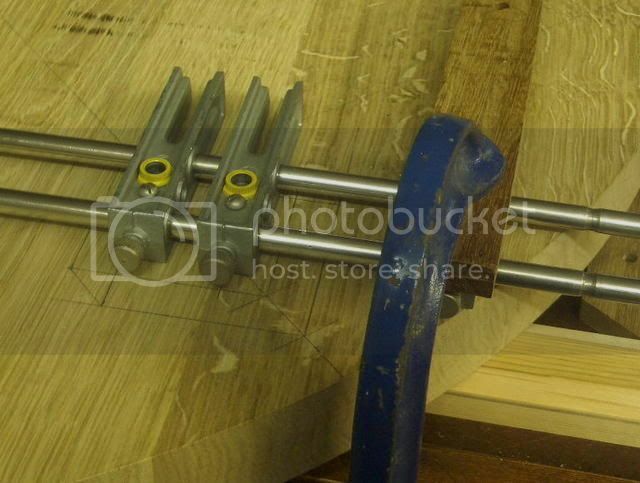 Clamped it to the table top with G cramps each end and a block of wood over two spare bush carriers. In order to ensure that the bush carriers were the same distance apart on both sets of rods, I used a Veritas set-up block between the carriers when fitting them. Don't think I could have done that with most dowelling jigs. Where do you get 3/8 silver rods as I have had problems getting them as long as I wanted ??? I've had mine from the local engineer's merchants. My local one is called K-Supplies and they cover a large part of North east Lancashire. The steel comes in rods up to 6 ft long. Have you thought about asking someone like Tilgear in Cuffley? I would also consider looking at the Joint Genie http://www.joint-genie.co.uk/ as an alternative - a sublime pice of kit utilising the old woodworking face and edge referencing to it's full. Although seemingly expensive, it will cope with pretty well every application where you may want to use a dowel, and is very simple to use, and accurate. Definitely one that I would recommend to anyone. I do (well, some times). As for p*wer drills and jiggies, I simply make my own from scraps laying about. I do use the drill jig bushings LV uses on their shelf drilling system. Incidentally, if anyone has any 10mm drill bushes for the Record #148 that they don't want and would be happy to sell, I'm looking for six of them. I purchased my Record jig back in the earlier 1980s. As several others have stated it will do things no other doweling jig I've encountered can do. My purchase included long rods and other extra parts. Like many British tools I also purchased (Marples chisels, Record planes, etc.) at the time I am very glad I did when I could get them. I think you Brits kept up the quality longer than the equivalent U.S. makers at the time until a new batch came along like Lie-Nelson and Veritas out of Canada. I'm restoring a 1901 trolleycar (tram for you folks) and it all comes in very handy. Well Alf, I appreciate where you'm coming from, but the thing is; a nole, is a nole, is a nole. The wood don't know how you made it and it don't care neither! My Record dowel-jigger is in my bench drawer. Hardly used, as it never would stay clamped up for some reasons. Not even when I tightened the turn-screw with pliers. Way too varying. Now the Woden jig... There's a piece a kit. Simple and it never fails. Just keep a 3/8 imperial drill nice 'n sharps, and use the dowel-plate for reduce 10 mill dowels. andrewking wrote: I would also consider looking at the Joint Genie http://www.joint-genie.co.uk/ as an alternative - a sublime pice of kit utilising the old woodworking face and edge referencing to it's full. Like this'n. Better in strength than the Kreggie. Cheaper than the ol' Domino. Easy to use as either. Consumables just the odd 10mm bit and topping up with 10mm dowels now and againe. I've got a Stanley on that I inherited from my father and the joint genie I bought a few years ago. The Genie is a well made piece of kit and very easy to use. I think a mag did a review on joints and the dowel ones came out rather well?